KANSAS CITY, Mo — Kansas City's skyline could change if plans for a new office tower are approved. On Wednesday, the city's finance committee approved the first office building since the early 1990s. The proposed 250,000 sq.ft. project called "Strata" would be at 13th and Main, right across from the H&R Block tower. Developers with Copaken Brooks said this fits a crucial need for the city. "There's a demand and we're missing out on that demand because of the availability of space," said Jon Copaken. One of those examples happened this past summer when Starbucks was looking for office space in downtown Kansas City and the city didn't have a lot of options. "We did run into an issue on that particular recruitment, they ended up going where they had a number of different options to pursue, whereas we really only had one option to present," said Bob Langenkamp, President, of the Kansas City Economic Development Corporation. The office space vacancy rate is at 8.8 percent, the lowest in many years which is a problem for companies looking to add jobs immediately downtown. "We frequently run into situation where there's a lack of options for Class A office space so this development proposal would bring a significant addition to the downtown office inventory," said Langenkamp. 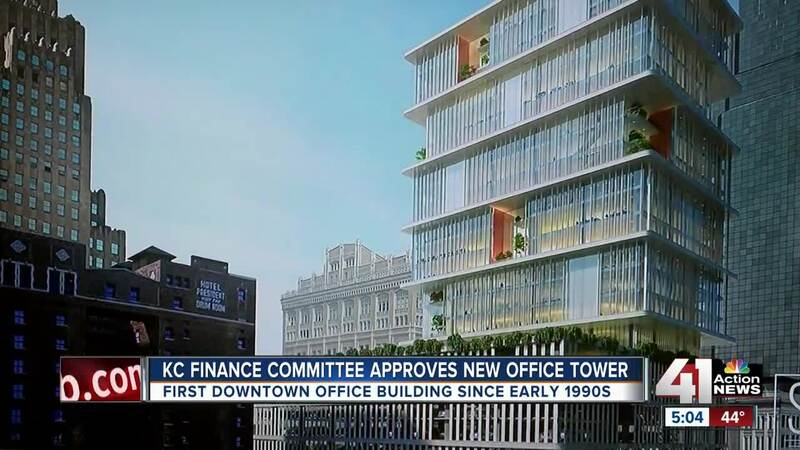 It was revealed at Wednesday's city council's finance committee that this office tower could house over a thousand jobs with a $60,000 a year annual salary, even though no tenants have been announced. "We've purposely reduced the amount of parking to be built, we think it's adequate for getting the project leased but spending our money on parking that's not necessary is not good for anybody city, or developer and so we're trying to push those levels as low as humanly possible," said Copaken. Councilman Quinton Lucas put in an amendment to allocate suplus revenues generated from the new office tower go towards the city's affordable housing trust fund. If the project is approved by the full council, construction could start Fall 2019.